Healthy teeth and gums are essential to feeling good about your smile and enjoying the food that satisfies your appetite. When everything in your mouth is healthy, you feel good and may even take your good health for granted. Periodontal disease affects the gum tissues and bones surrounding your teeth. It is characterized by a loss of attachment between the tooth and the jawbone as indicated in the drawing above. Periodontal diseases range from simple gum inflammation to serious disease that results in major damage to the soft tissue and bone that support the teeth. Gingivitis is the first or earliest stage of Periodontal Disease, in which plaque and biofilm begin to harden and irritate the gums, making them tender, inflamed and likely to bleed easily. When caught early, a thorough cleaning may be all that is needed. However, if your gum disease has progressed into Periodontitis, a special deep cleaning called Scaling and Root Planing will be necessary. 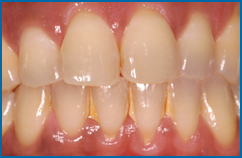 Periodontitis occurs when plaque calcifies into tartar and causes recession of the gum line from the teeth. The space between the teeth and gums forms what is referred to as pockets. These pockets become filled with bacteria and pus. Advanced Periodontitis occurs as gums, bone, and periodontal ligaments continue to be destroyed and tooth loss is most-likely imminent. 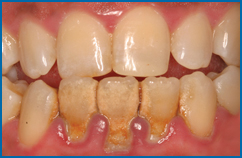 Without the right foundation, even healthy teeth become loose and without proper care, may need to be extracted. What is the difference between a cleaning and a Scaling and Root Planing? A Dental Prophylaxis Cleaning (Prophy or standard cleaning) removes only the soft sticky plaque and calculus that is above the gum line. Scaling and Root Planing is an advanced periodontal treatment that scales or removes contaminated debris, calculus (tartar), and pus loaded with bacteria around and deep below the gum line in the periodontal pockets. During root planing the root surface is smoothed down to prevent more plaque from adhering. For your comfort, you will be given anesthetic to numb a section of your mouth prior to beginning the procedure. Usually if all areas of your mouth are in need of a Scaling and Root Planing, then this type of cleaning is done over two office visits with the hygienist. 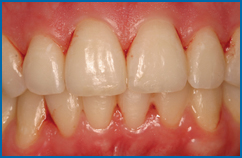 The goal of Scaling and Root Planing is to help the sulcus shrink back to an appropriate depth. Controlling the infection is a vital part of the healing process. It is critical you follow all instructions to properly care for your teeth. Periodontal disease can only be properly diagnosed when a periodontal probing instrument is used to measure the sulcus or space between your teeth and gums. The sulcus should be less than 3 mm deep. A pocket depth of 4 mm or more is a sign that you have gum disease and may mean you have an infection. A pocket depth of 7 mm or more has the highest risk of permanent damage. If you wait to treat your gum disease, it could lead to painful and expensive surgery in the future. If you are diagnosed with any form of periodontal disease, you will be treatment planned the correct course of action to care for your teeth and restore them to a healthy state. The type of periodontal treatment necessary depends on the severity of your periodontal disease. The staff at M Dental will educate you on the right course of treatment for your condition. If is important to recognize that Periodontal Disease can become quite serious if left untreated. Periodontal disease is NOT curable, but can be improved and maintained, thus reducing the systemic effects. Periodontal disease is an infection of the gum tissue and bones surrounding the teeth. The number one cause of periodontal disease is the buildup of plaque. Plaque that stays on the teeth can harden and turn into tartar in as little as 24 hours. While brushing, flossing, and rinsing are absolutely necessary, they cannot always remove plaque from hard-to-reach spots, such as behind and in between teeth. Regular periodontal maintenance appointments about four times a year may be necessary. During these maintenance visits, your teeth will be thoroughly cleaned in order to remove plaque above and below the gum line.